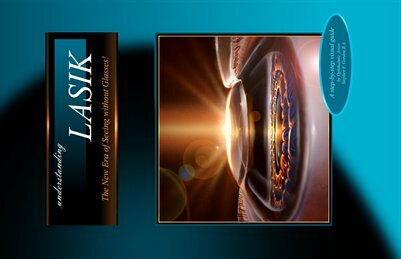 A step-by-step visual display defining Anatomy and History of Lasik, with RK, PRK, Types of Lasers, Corneal Flap Preparation, Eye Tracking, Wavefront Scanning, Lasik for Myopia, Hyperopia, and Astigmatism. Subjects presented in a flowing, easy-to-understand storyboard fashion as a large fold-out display. Over 60 illustrations in 7 plates. Essential specialized Physician-Patient Consultation Illustrations for every exam room.